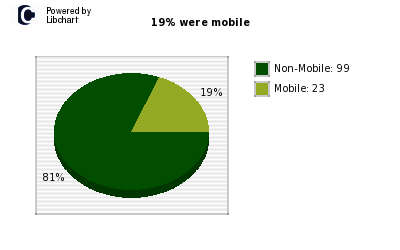 How Important is being Mobile to YOUR site? The world is going mobile. Show a visitor something that is hard to read and they go away. Additionally Google lowers the search rankings of non responsive sites for those searching from mobile devices. Other search engines may follow. Some specialty sites may have an industrial audience that does not browse from mobile devices. Google is not lowering your search ranking overall, only when the search is from a mobile device and these sites are not affected. Still, mobile is growing. Even if you do not need mobile now, next month may be different. Here is a quick summary of how to check the site traffic logs to see how much a factor mobile browsing is for your site. If in doubt, write to help@hotdoodle.com and we will let you know where you stand with respect to responsive visitors. In the archives chose a recent week. Scroll down a bit and click on "Skip to Summary"
The first chart will report on the fraction of your visitors that were mobile.